Did you know that today is Intergenerational Day in Canada? 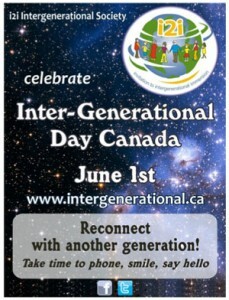 Intergenerational Day Canada June 1st provides an easy opportunity to raise awareness in classrooms and in daily life of the many benefits that simple and respectful connections between generations bring to education, health and community safety. Stereotypes of both young and older people are broken down when they learn about each other. Isolation is diminished and empathy grows in both directions. Intergenerational Day Canada makes a powerful statement about the value of generational connecting within each and everyone’s neighbourhood. To read the entire news release visit the following link.